This document is intended as an introduction, or exploration, of the Long Form script unit that I have created for Grade 12 drama. 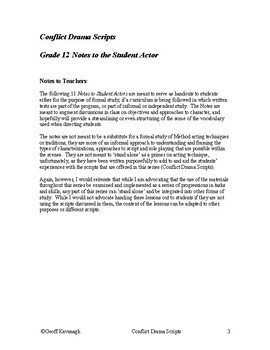 In this document are 11 separate lessons (entitled “Notes to the Student Actor”) that are to serve as an introduction to modern acting techniques beyond what was covered in the Neutral Scene Unit and in previous years. Each of these lessons is intended to be either the focal point of class discussions or given as a handout for independent study. They are the product of years of discussions I’ve had with my students about their approach to character, rehearsal and performance. 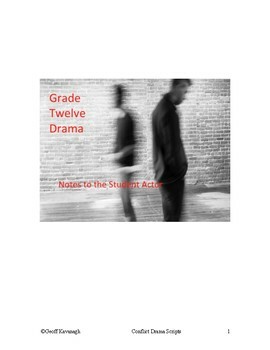 These “Notes” represent a specific approach to teaching Grade 12 drama that is based in modern acting training methods. 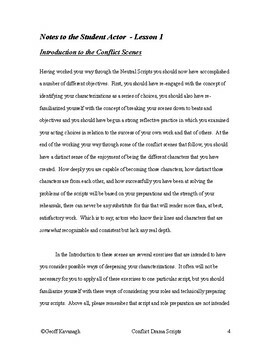 This is a script-based approach (begun in the Grade 10 Conflict Series) in which students learn to create characters in relation to 'conflict' situations by using objectives and the identification of characters' conflicts, needs and desires. These notes make specific references to the scripts being studied, and thus are tailored to the students’ experiences as they work their ways through the scene unit. Teachers should note that this represents the culmination of a 3 year long approach to using these scene types as the basis for formal acting training. All of these scenes have been used in my classroom for years, and their effectiveness with their intended grade levels has been extensively tested. This product is not only intended for experienced teachers looking for materials, specific scene types and teaching methodologies. As these notes offer an extensive explanation of an approach to teaching drama they would also be of use to beginning teachers.